Okanagen is an Indian word meaning "rendezvous". Originally applied to the river's head at Osoyoos Lake on the B.C.-Washington border where Indians gathered annually to trade and hold potlatches. The Thompson Okanagan, long considered British Columbia's breadbasket, lies at the center of the province, surrounded on the west by the rich farmlands of the Vancouver mainland and Fraser Valley and on the east, by the Rocky Mountains. BC's fruit orchards and wineries are nurtured by the warm summers and crisp winters of the Okanagan valley. The temperatures are a perfect combination for the province's favorite vacation destination. 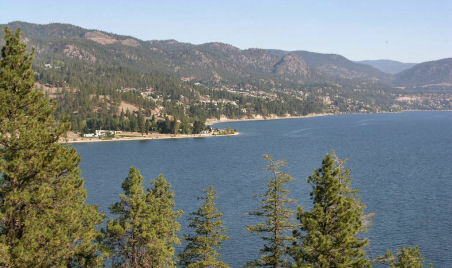 Okanagan Lake as seen from Highway 97 looking north toward the town of Peachland. Home of some of the Northwest's top winter recreation areas, the Thompson Okanagan is easily accessible by a number of routes. Good roads and signage connect the Vancouver area with the region. The Coquillhalla Highway, BC's toll road, cuts diagonally across the state from Hope to Kamloops and provides an easy drive to the city. From Kamloops, excursions to the Okanagan's ski resorts and wineries are just hours away. For those who prefer a more picturesque route, Highway 3, which runs west-east along the Canadian-U.S. border to Osoyoos, or Highway 1, which follows the historic gold miners' trail through the Fraser Canyon to Kamloops, are well-paved, though slower highways. Highway 97 is the Okanagan's main north-south corridor and runs for several miles from the border with Washington State north to the towns of Osoyoos, Penticton, Summerland, Peachland, Kelowna and Vernon, all of which lie alongside Okanagan Lake. Lake Okanagan, at the center of the region, is known for its miles of sandy beaches and Southern California-style summers and is frequented by travelers from around the world. South of the border, Highway 97 takes the traveler through the towns of Chelan, Omak and the warm, arid lands of Washington State's own desert ranchlands. But no matter which road is taken, an excursion to BC's play land is worth the journey. Click image above to open map of British Columbia Wine Regions in a new browser window.